Better packaging means better protection. 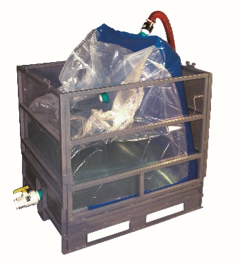 The Air-Assist® liner has a yield improvement from 95% to 99.5% for packaging semi-fluid liquids like olive oil, tomato sauce, or tableside condiments versus traditional IBC packaging. The Air-Assist features a form-fit liner with an attached air bladder. 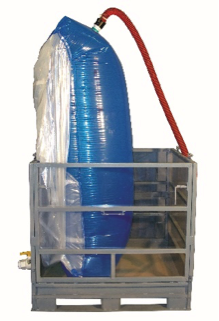 As the air bladder is inflated, it pushes against the form-fit liner, forcing the viscous product out of the bottom dispense fitment. 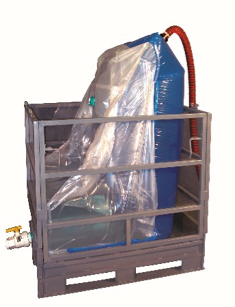 Air-Assist liners are designed for convenient dispensing and improved evacuation of high-viscosity liquids ranging from 2,000-20,000 Centipoise (cP). The Air-Assist liner is hands-free. After attaching the Air-Assist Regulator System, the operator can walk away during dispensing, knowing your product is safe and secure. 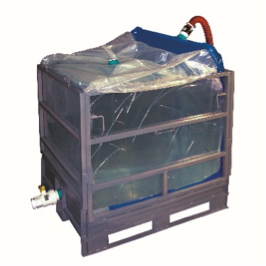 CDF stocks the necessary adapters to make the transition from an existing IBC container to the Air-Assist very simple. Download our brochure by filling out the form at right. Find the right Bag-in-Box solution for you.